Decompress folder into your locations folder. Paddock/Garage: Head towards your LEFT in the garage area. The real race had the big white tents house all the cars but its easier if I used as much of the outside as possible to avoid confusion as to where pit lane is. The top 30 garage spots are outdoors, the remaining 20 spots are inside the tent. 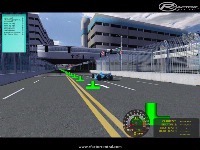 Blue/white cones/lines denote pit lane entry and exit points, as in real life. Pit lane entry wall has a "chicken exit". Its a gap in the left wall just before the actual pit-in where a car might be able to re-enter the track. This was there in real life as well but not for the same purpose (allowing ground traffic). Leagues using this track should decide beforehand to allow this or not. Obviously theres no benefit to using it but it might lend to cars colliding as they re-enter the main circuit. Normal: This is the 2007 race configuration of the circuit. The 85MPH speed limit sign is only there for realism. 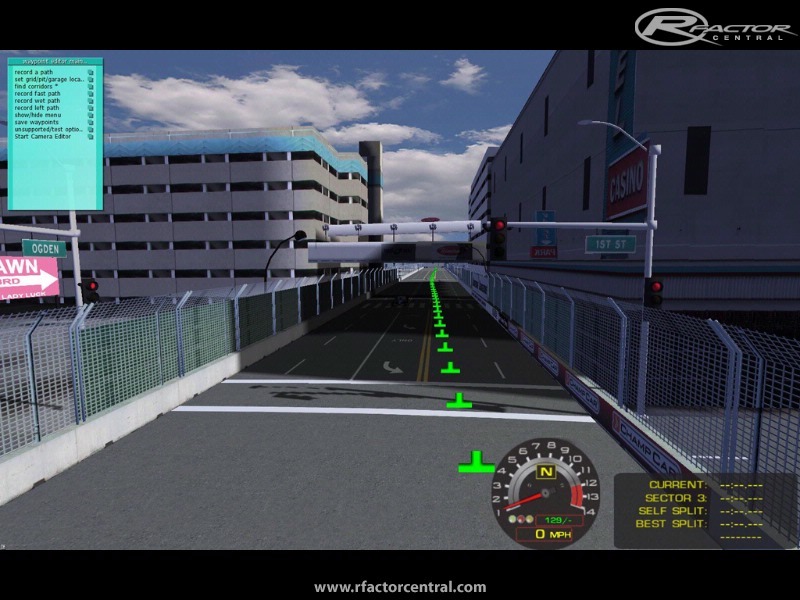 rFactor does not have the capability to enforce 2 pit lane speed limits so the 2nd pit-in light is where the 50mph limit is enforced. No chicanes: This version is the track with the chicane removed before pit-in. 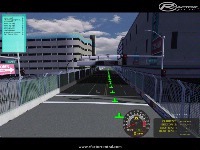 Both versions can have erratic AI behavior due to the S curve through the city's narrow streets. Adjust your AI strength accordingly. Thanks to Justin for taking photos on demand. v1.5 packages all 3 versions together and fixes the pit lane lap bug. V1.6 fixes firetruck bug. Optimizes shadows and some maps. 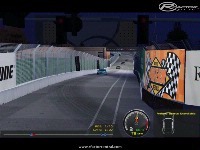 There are currently no setups for Las Vegas GP 2007. Add a Setup. Love the track, just a few things need sorting though, no lap is added when entering the pits nor is one added when leaving after comming into the pits, the AI driver assigned the garage position behind the Las Vegas fire truck does a 180 & drives the wrong side of the concrete barrier through the tent area. though it is able to get on the track at the end, sometimes the gearbox gets destroyed. The Chicane area could do with better lighting as I missed it totally on one lap & that lap still counted for some reason? Is there a track map available that shows the real street names? I'd like to see how it fits in downtown. I may go pay a visit on my next trip to Vegas. A real street circuit, which puts a strain on the brakes, especially the nerves of any drvier. A mix of acceleration, sudden braking, turns between narrow walls, speed bumps, manhole covers and tricky chicanes make the circuit particularly demanding, is faced with a F1, Indy or a Stock, etc. .... also the final tunnell that bisects the line from the pit-lane. Have fun everybody! no need for concern, Simraceway has secured a license. I'll look into that, probably just the file name at the bottom of the .gdb files. Laptimes for 3 different versions are all saved under 1 layout though. The track will have a non-commercial/non-promotional license. Same as my long beach track. I have to attend conventions and races that would use this track illegally in order to protect it. Not many people do this but I did catch one of the IRL teams using our track illegally. I issued a cease/desist order and they humbly apologized and complied (dan wheldons team). So any convention at Las Vegas that has motorsports (SEMA and CES) I need to attend in order to protect my intellectual property. This is why I want one of the features on the new simraceway.com to be a mandatory license selection so people know exactly what they are allowed and not allowed to do with someone else's work. 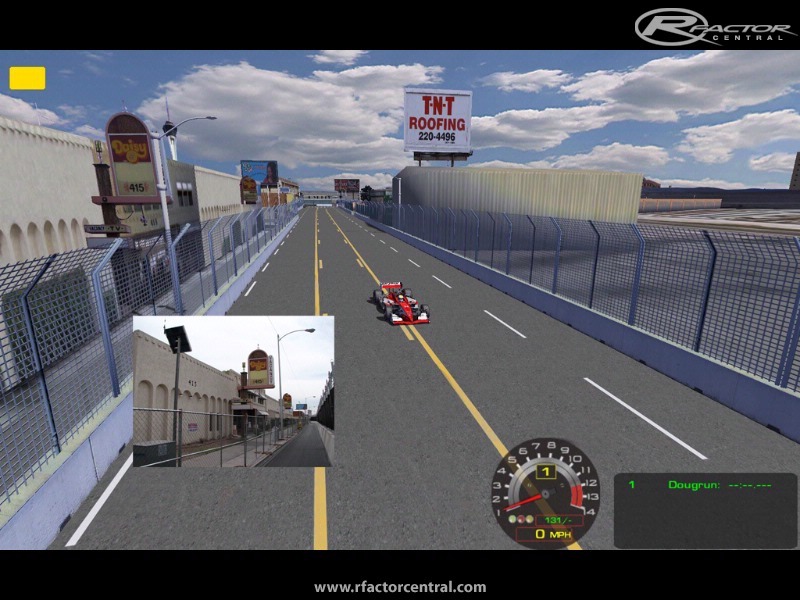 I doubt this race will ever be held again so theres little chance of drivers wanting to use it but casinos and simulator companies would love it for the convention center. Simraceway is soliciting entries to a pay to race event, Open Wheel Challenge 3, featuring the iDT 2006 Champ Car mod and the Las Vegas, Long Beach, and Cleveland tracks. Isn't this in violation of the iDT's non-commercial use policy? Did SRW secure a written license from iDT to use iDT IP for commercial gain? If not, what action to you intend to take? hey doug, thx again 4 the track. great nigth version although, in my opinion, it is still missing ligths in the tunnel section. it simply gets too dark even with ligths on. 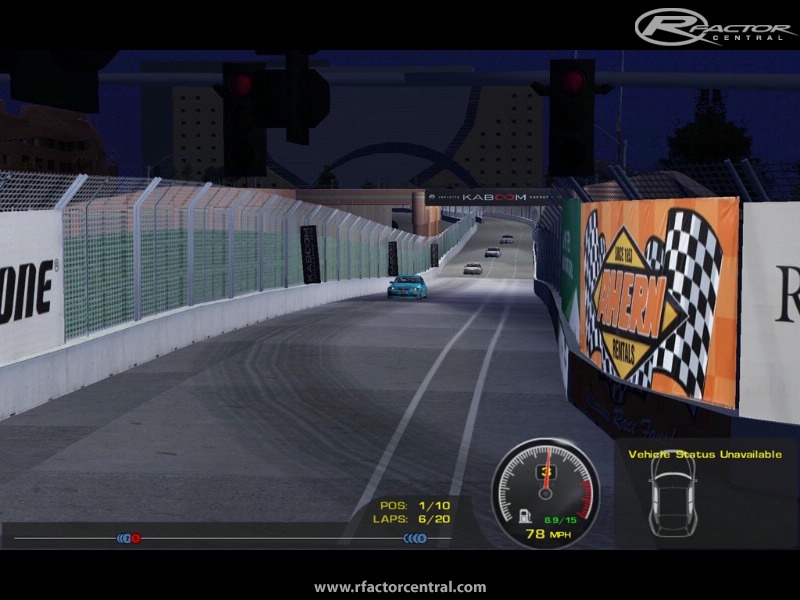 the chicane...almost imposible to see it in the middle of the nigth (again, perhaps the area is too dark), last comment, FPS....ugh is kinda very low compare to most of the "good" rfactor tracks. I have hosted the track several times with the enduracers mod going over the nigth, it is very enjoyable...realy , tho me and others need to run with all medium and DX7... , grats anyways . there will be another patch for this, the firetruck material name is the same as the fire name in rF so if you catch on fire, you see firetrucks, not fire. Maybe tonight or this weekend.